We tried. Sub-2 is 20 odd seconds closer, thank you. Such might have been Nike's drumbeat yesterday, as a months long planning and execution process bordering on OCD brought Eluid Kipchoge to run the fastest recorded marathon in human history. At 2:00:24, the attempt to break the sub-2 mark may have failed, but the feat of running 2 hours at an average speed of 5.84 m/s is astonishing to me as a runner. The climate made for perfect running conditions. Temperatures were in the cool teens. A windrose chart shows winds were mostly ESE during the day. With the orientation of the track in the NNE-SSW direction and a counter clockwise running direction, a headwind would be felt if at all only at the southern short end of the track. Rest everywhere, you'd see either a tailwind or a sidewind. With near perfect pacelining and draft coverage even from a moving vehicle however, the task at hand looked daunting from get-go. Until now, the fall in the marathon world records have been very non-linear. Perhaps this is reflective of the course specific nature of marathon times as well as influence from a host of externalities such as training, hydration and climate. But some simple stats help understand the level of difficulty involved in every incremental improvement towards sub-2. IAAF standardized marathons began in 1921. The marathon record in 1925 was 2:18:40. It took 28 years for the world record to fall 10.35 minutes, i.e 621 seconds. Put in a somewhat corrupted way, if you were to spread that among 28 years, that's not more than an average of 22 seconds per year. From 1953, it took just 14 years to shave off another 538 seconds. Or, an average of 38 seconds time decrease per year which is an interesting rate of decrease, a subject for another day. But from thereon, it took almost 47 years to knock off another 399 seconds. That's a tiny decrease of 8 seconds average per year. A better visual shows how the time knocked off between each marathon asymptotes to a window about 43 seconds wide. See below. I've included Kipchoge's time only for perspective of the advantage he had from a controlled strategy. However, the time is not recognized by IAAF. Given this simple history, it would seem plausible that the remaining 178 seconds would be knocked off. But the question is how long that would take. If we consider a 'generous' average of 30 second decrease per year, breaking 2:00:00 would take just 6 years. But if the task is considered exponentially difficult and we accept that only a 1 second decrease per year is possible at this level of racing, it would take a whopping 178 years to achieve. So is there an opportunity between these two extremes? Will it be 15 years or 20 years? That's where the Nike's experiment fits in. Kipchoge and gang showed that even under the most controlled of conditions (some in clear violation of international marathon rules) and with the best athletes and level of technology available today, we humans are still shy of the barrier by 26 seconds. Close enough to warrant another try? Well, that's the debate. The best distance runners from Africa are nearly equal in abilities these days. Their training is similar. They eat similar kinds of foods. They live at the same altitudes. So what must be the differentiator among them? Sports practitioners talk about the "smallest meaningful change" defined as the minimum change in performance worthy enough to determine differences between top competitors. For example, if a group of elite runners trained for months and showed a between-athlete standard deviation of 10 seconds in a 20K running test, the smallest meaninful change would be 0.2 x 20 = 4 seconds. In other words, anything above 4 seconds is an appreciable change. Anything less and it's just day-to-day noise. Take another perhaps more representative example. Berlin 2014 was where the current world record shattered. In the last 5 years, the average standard deviation between the times of the 3 podium placers was just a minute and 25 seconds. The smallest meaningful change in an elite runner's performance for positive differentiation would be 0.2 x 85 = 17 seconds. For today's elite marathoners showing such a tight cluster in finishing times, 17 seconds means everything in the world. Nike publicly put their money in the aerodynamics basket as they pitched the marketing effort of the Sub-2Hr. Not much in the way of technical data has emerged from Monza. Therefore, I got curious enough to evaluate running energy savings on the table from just aerodynamics alone. In human powered land transport, oxygen cost increases as a square of wind velocity. Experienced middle distance track runners can attest to the energy savings experienced even with a small amount of drafting. Pugh (1971) showed that at 4.5 m/s, his runner saved 0.250 l/min in oxygen cost by running behind another runner within a separation distance of 1 m. He extrapolated this figure to 0.332 l/min for a speed of 6 m/s and stated that for outdoor conditions, a runner can expect to overcome 80% of the energy cost of overcoming air resistance through shielded running. In any mass event, it is not reasonable to be within touching distance of a runner in front of you. Pugh measured dynamic air pressure with a Pitostatic tube and showed that even at a separation distance of 1 m, air pressure was still only 7% of the value upstream of the lead runner. This might mean there are potential benefits to be had even at larger separation distances. I also assume that like in cycling team time trial efforts, the leading runner can experience benefits as well by virtue of reduction in airflow separation in the wake due to the presence of a runner close behind. I'm not aware of any studies which have looked at the cost savings on the leading runner. In an ideal marathon situation, it maybe possible for the favorites, all excellent in fitness and form, to getaway and stick with a tightly knit pacing formation until the very last kilometers of the course. The one competitor who will make most of this formation and slow down the least can be expected to win. An analogy can be borrowed from long distance thoroughbred horse racing. The best finishing horses almost always spend the most time drafting. The horse that slows down the least emerges the winner. Furthermore, thoroughbred horse racing is an interesting example because it exhibits a similar cluster of best times as seen in human marathons (although this has been the case for a longer period of years). 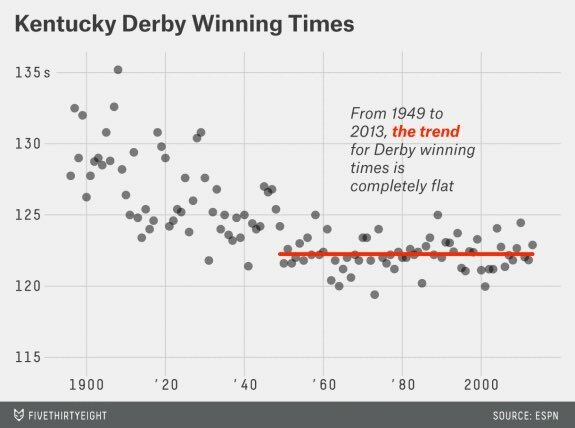 If this means both horse racing and marathon running have 'plateaued' in terms of race times, looking to the next frontier to improve timing is justified. At Monza, Nike used laser lights to guide the runners within an arrow formation which effectively shielded main-man Kipchoge from three directions. But we saw a pace car driving 10-15 metres before the lead runners which could have also potentially changed the flow field. The Sports Scientists joked that the unsung award for this sub2 attempt ought to go to the Tesla. But must we exaggerate the effect of a vehicle 10-20 metres ahead of you? Certainly in the image above, it doesn't seem the runners would have a "massive" advantage at the distance they are positioned behind the car. Infact, the difference in air pressure and x direction air speed is dependant on where you are behind the car. I did a simple 2D CFD simulation to show that the effect isn't is great as some may think it is. Since the simulation takes a long time to run, I ran it for a few milliseconds of real-world time. The road boundary is assumed to be moving at 5.84m/s and at the left end of the domain, the boundary condition for air velocity = 2.77m/s and air pressure of 100000 Pascal. In the first image, I have sliced a cross-section in the X-direction at roughly the height of the car behind the car. The bold black line shows the profile of the difference in P - Po, where P = instantaneous air pressure and Po is the initial air pressure of 100000 Pascal. 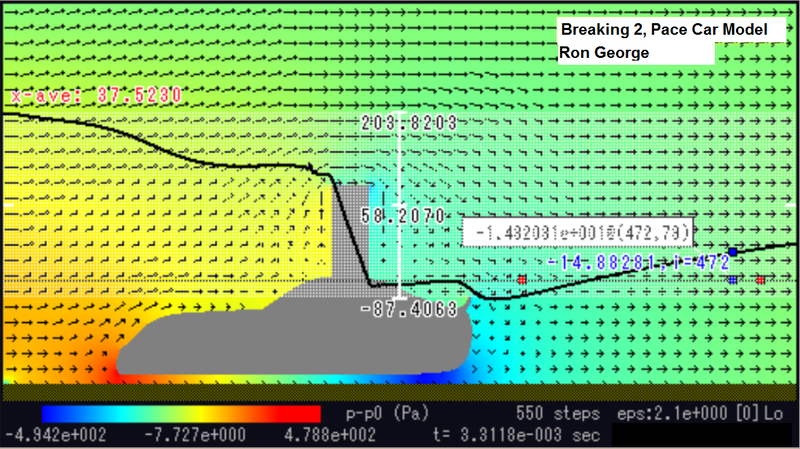 In the second, I've shown the distribution of horizontal air velocity in the same plane as above. Summary : Yes, there is a reduction in both parameters which gets bigger the closer you are to the car. For example, in the P-Po simulation, the air pressure behind the car at where I think the runners were is only some 14.8 Pascals less than pressure upstream of the car, therefore total pressure is still intact. Therefore, at the distance the runners were shown in the live telecast, the effect is not "as great" as people are making it out to be. However, the question is also whether it was justified to use such a prop in the first place. That's the debate in the running community. Mechanical power for a runner to overcome air resistance is proportional to drag co-efficient CD, the relative velocity between wind and runner vr, horizontal running speed vf, air density ρ and the frontal area of the runner A, projected perpendicular to flow of air. In general, the dependance of power to overcome drag on speed is cubed and the dependance on density, area and CD are all to the power of 1. A step change in running speed on a zero wind day will triple the power requirements, all else kept the same. Pugh (1971) estimated for a subject runner at a treadmill speed of 4.47 m/s and wind velocity of 14.14 m/s, wind pressure was 6.24 kgf which required a horizontal power of 27.89 kgf.m/s. CD is dependant on Reynold's number, a useful dimensionless co-efficient in fluid dynamics. At this Reynold's number (Re) of 63,000, flow is all turbulent. There is a 'critical' Reynold's number where a precipitous drop in drag co-efficient is exhibited, atleast in theory. For a cylinder, this is qualitatively shown below. A table from Pugh (1971) also quantifies the curve shape of drag co-effcient as a function of Reynold's number. Notice this effect first occuring at Reynold's number somewhere between 20,000 - 25,000. If I consider Kipchoge's smaller stature, a chest circumference of 90 cm instead of 100 cm and a speed of 5.84 m/s, I estimate an Re = 110,800. Comparing this value to the plot above, it already "seems" his drag co-efficient was in a low place, if not the optimal place for his speed. Again, this is an estimation. It would be quite nice to see whether Nike researchers found this in practice. Ideally, a talented runner will have an optimized frontal area and will neither be too short or too tall. For example, a runner with a height of 179.9 cm, weighing 65 kg and having a surface area of 1.78 sq.m has a projected frontal area of 0.478 sq.m. Perhaps Kipchoge was perfectly suited for the task. At a height of 168 cm with a race weight of 57 kg, Kipchoge's frontal area would have been 168/179.9 x 0.478 = 0.446 sq.m (notice I employed a simple ratio from the previous example). Compared to the example runner, this reduction in Kipchoge's frontal area equates to a reduction in drag force of nearly 7%, all else kept the same. Projected area is directly dependant on height and weight and to an extent, the type of running motion and running lean angle exhibited during the gait. Optimizing the latter two aspects should not come at the expense of running economy. Nike's PR mainly revolved around a pair of shoes designed for Kipchoge called Zoom Vaporfly 4%. The shoe has an interesting shape and is streamlined at the back end. The purported benefits are 4% in energy savings through a carbon sole plate, although there is no published data from Nike to back this. Some data from the research arena is starting to come out. A study supported by Nike and the laboratory of Rodger Kram (one of the few experts on the planet to know a thing or two about running energetics) found it took 4% lesser energy to run in the prototype Nike's compared to two other shoes. Fascinatingly, one of the two control shoes was the Adidas Adios Boost 2, the same shoe worn by Kimetto while toppling the current world record. There's only an abstract available from the study and some key points are underlined below. I certainly have my doubts over the 4% number, but if we assumed this were correct, then I have projected time savings that an ordinary runner could potentially experience. 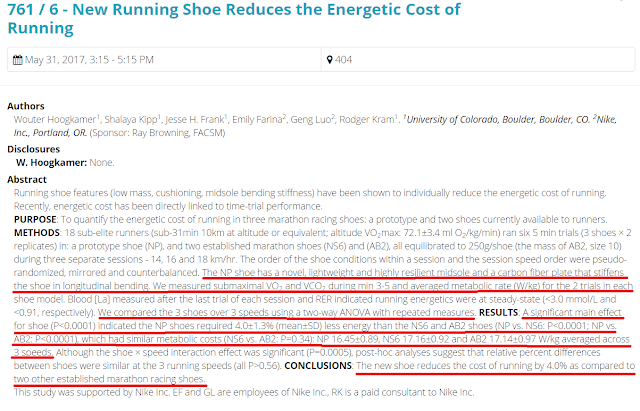 The calculated savings seem huge on account of economy improvement through the shoes itself, which is why I doubt we can apply the 4% number from the study to any running situation as is. The running feet exhibits both translational speed of the runner and the rotational speed through the leg swing and leg pitch. An elite marathoner runs at step rates of around 3 Hz. The legs will swing a total of 14,400 times in an ideal scenario. That's 7,200 times each leg is thrown about. Cycling is another area which approximates the rotation and forward translation of the feet, although in a more constrained way. Gibertini et. 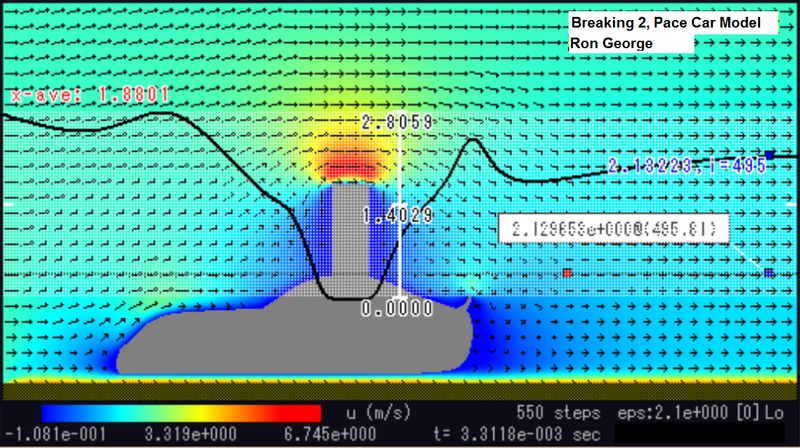 al tested three cycling shoe configurations in a wind tunnel and noted that a well fitting laced shoe exhibited the least power demand, around 15W in total. Given that this was a laced shoe, perhaps we could compare the numbers to that of a running shoe for perspective. The air speed in this cycling study was more than 2 times that of marathon running speed so it might not be entirely representative. Moreover, even during controlled running motion, African runners tend to show great degrees of knee lift, leg turnover and swing angle which differ from that of cycling. Qualitatively, the crank angle based power diagram highlights that shoe drag power is a function of where the feet is during it's rotational motion. Drag power was greatest at top dead center (Θ = 0) and least when the shoe was at 90 degrees before bottom dead center (Θ = 90). Perhaps this idea can be extended to the running scenario by assuming that shoe drag might be the most when the lifted foot is at it's highest point and least when both feet are off the ground on the sample plane during mid-stance. I'm unaware of an actual study done in this fashion with running shoes. Other reseachers have pointed to the benefits of a "dimpled" frontal shoe surface. Finally, notice that none of the runners that attempted this event wore socks. One study by Ashford et. al compared a dozen socks on a form tested under the wind tunnel and found little variation in drag co-efficient among them. A couple of socks exhibited a drop in CD at low Reynold's numbers which maybe just a reflection of optimized behavior during lower running speeds. In hunting for mere seconds to win a race, this maybe a potential avenue to look into. Any benefits though have to be traded-off with potential discomfort and blisters during a fast running attempt. Another fairly obvious aspect was tight fitting clothes. Notice that none of the runners tucked their shirts into their shorts as many amateur runners do in marathons. Also, just Tedese, Desisa and Kipchoge wore arm warmers among all runners. I'm assuming it was more than just for warming the skin. In the grand scheme of things, most marathon world records these days are pre-dominantly mental. Who can suffer the most for the longest? 1) In the best case scenario, I estimate that the 2 hour marathon record will be broken within the next 6 years. In the most conservative scenario, we'll be long dead before that happens. I'm an optimist however. 2) Top podium worthy marathon timings are often spread by less than a minute and a half. The degree of improvements necessary are small and to be placed within context of the smallest meaningful change. The degree of enhancements from aerodynamics may help push past this threshold of beneficial change. Side point : This may also limit the scope of commercially sold running instruments for tracking performance if they do not have the required fidelity/sensitivity to capture small improvements. 3) Running in a scientifically optimal ambient climate sets the density and viscosity of surrounding air for the optimal Reynold's number. Temperatures below 50 deg C may not be ideal. The conditions in Monza have been noted to be picture perfect for sub 2 hour attempt. It was not too cold to for non-optimal Reynold's numbers and not too hot to demand increased cooling. 4) Wind creates drag force which requires externally supplied power to overcome. It general, it increases as a cube of speed. As a rough rule of thumb, a +5 mph head wind relative to calm conditions increases oxygen demand by approximately 5% relative to calm conditions. Conversely, a tailwind decreases the horizontal power demand of running. Note that wind speed shall be considered at the center of gravity of the runner, not at the 10m wind station. 5) Optimal drag co-efficient is a function of Reynold's number and further on running speed and anthropomorphic aspects. Running posture may affect the frontal area presented to the wind. 6) Optimizing clothing to improve aerodynamics is justified for small incremental performance benefits. Even shoes and socks may contribute to reduced power demand of fighting drag. A lack of adequate published literature in this area presents a good opportunity for engineers, biomechanists and sports scientists to get together. LG, Pugh, The influence of wind resistance in running and walking and the mechanical efficiency of work against horizontal or vertical forces. J Physiol. 1971 Mar;213(2):255-76.